Sunshine Spray is an exceptionally mild combination of floral waters, known for having similar properties as essential oils but in far less concentration. They are aromatherapeutic, antiseptic, anti-bacterial, and anti-inflammatory. 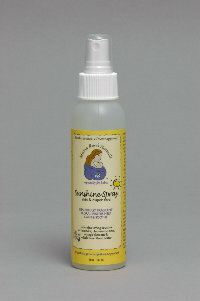 Sunshine Spray can help relax and ease anxiety, while also helping to relieve and cool skin irritation and diaper rash. This is a great product to have in the car, diaper bag, and while traveling. Suggested Use: Apply to minor cuts, burns or insect bites as a mild anitspetic and to help sooth irritation. Spray onto a reusable diaper wipe, or if your baby doesn't mind directly onto their bottom to help cleanse, sooth and deodorize diaper area. Spray onto a washcloth to cleanse face, hands, knees or feet. Pour into baby's bath water for an incredibly calming, aromatic bath experience. Use to cleanse a newborn instead of harsh soaps or cleansers. Use as a detangler on fluffy hair days. Freshen, deodorize, and promote relaxation by spraying a room, bed linens, clothes or hamper. Use to gently disinfect toys. After giving birth, mothers can spray around the vaginal area to help sooth post-birth discomfort. Adults can use it as a facial toner or rejuvenating foot spray. Ingredients:Sunshine Spray contains loving touches of rose, lavender, chamomile, orange blossom and witch hazel floral waters.